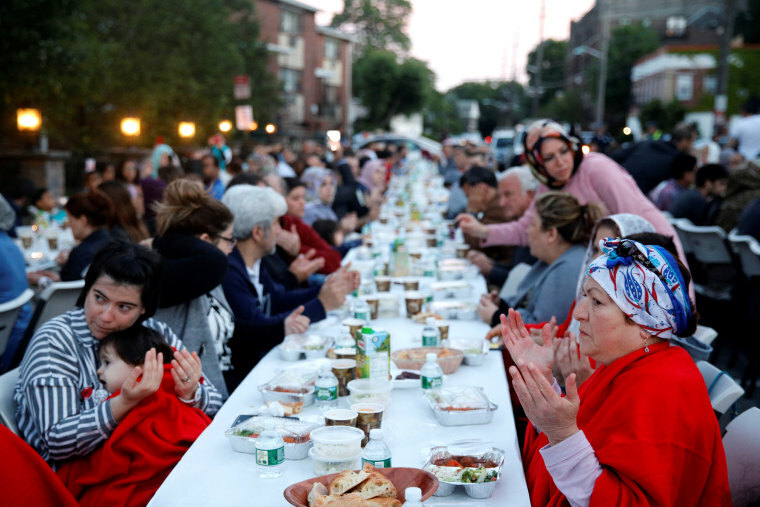 A New York nonprofit has organized a series of Ramadan iftar meals at synnagogues and Jewish households to build religious solidarity. Rivka Cohen sang the Jewish Hamotzi blessing over challah bread for Sabbath dinner last Friday as she regularly does. But while she often hosts these dinners, this one for her 18 guests, some of whom were Muslim, was different. Cohen, a 24-year-old Orthodox Jew, prepared iftar, the meal used to break fasts during the Islamic holy month of Ramadan, which this year ends the evening of June 14. The dinner included dates (a staple fast-breaking food for Muslims), challah (a Jewish bread eaten on special occasions) and a Moroccan dish she recently learned. All around the country, mosques and synagogues have come together to learn about one another, wanting to build bridges due to increasing bigotry such as Islamophobia and anti-Semitism. And in lieu of wine that often accompanies Sabbath dinner, Cohen had grape juice ― as alcohol is forbidden in Islam. Cohen's iftar is a part of a series organized by the Muslim-Jewish Solidarity Committee that hosts the traditional Islamic meal in synagogues and Jewish homes across New York City . Just a day before, Cohen attended another dinner organized by the group at a Jewish congregation in Manhattan with about 250 attendees. Each table was tasked with an activity to engage Jewish and Muslim guests in a dialogue. At the synagogue, one guest spoke about his hometown of Morocco, where the Jewish community began disappearing years ago. As a Muslim, he explained that this history is what drew him to participate in the joint dinner iftar meals. Another woman shared her experience as a Muslim converting to Judaism. Munir, from Lahore, Pakistan, is a Ph.D. student in New York and said her exposure to Jewish communities and cultures was limited before she moved to the city. The Pakistani government does not publish the number of Jews in the country, but a 2015 Pew Research report said that only 1.5 percent of all Jews resided in the Asia-Pacific region. Globally, Muslim-Jewish relations are often portrayed negatively, and is associated largely with conflict, like that of the escalating tension between Israelis and Palestinians in the Middle East. Following March protests against the U.S. embassy opening in Jerusalem, more than 115 Palestinians have been killed and thousands more wounded by Israeli forces. Maha Elgenaidi, founder of the nonprofit Islamic Networks Group in California, has been working on Muslim-Jewish relations in the U.S. for more than a decade and said that while Jewish and Muslim communities have always worked in solidarity, the relations have strengthened since President Donald Trump’s election in November 2016. "All around the country, mosques and synagogues have come together to learn about one another, wanting to build bridges due to increasing bigotry such as Islamophobia and anti-Semitism,” she said. Michelle Koch, the executive director of the Muslim-Jewish Solidarity Committee, said her team of volunteers began organizing synagogue iftars for Ramadan four years ago as a one-off event. Last year, noticing the response to previous events, they had a series of 15 iftars in synagogues and Jewish homes across New York. Earlier this year, they also organized a Passover meal in a mosque. Their events are themed; last year they focused on hunger in New York and this year the spotlight is on violence against women, featuring speakers from advocacy groups working with domestic violence survivors in the city. “There is always amazing diversity at our events that’s been wonderful,” Koch said. “It expands your own spirituality when you learn so much about other people’s experiences." The events, Koch added, “gives people hope to get to know each other and to break down whatever misconceptions they had about each other." Cohen, who studied Islamic and Middle Eastern studies in college, agreed. For Cohen, upon studying Islam in her spare time and seeing all of the similarities to Judaism — including rituals of fasting and daily prayer, similar holy languages, some identical stories in the Quran and the Torah, and most importantly to her, the core belief in the oneness of God — the Israeli-Palestinian conflict and the religious tension in the region didn’t make logical sense. “I feel like the religious bridge is something that can hopefully help there,” she said. The similarity between the two religions is a sense of hope for other attendees as well, such as Munir, Hoffman and Musa Demirtas, 32, who attended Thursday’s iftar.